The growing Methamphetamine problem has becoming a major focal point in the media and political landscape of Australia. In recent years, the ‘ice epidemic’ has been at the forefront of news and current affairs, with both the police and their political counterparts attempting to combat this issue. This has meant that the laws criminalising these offences and the punishments for being charged with them have become increasingly stricter. 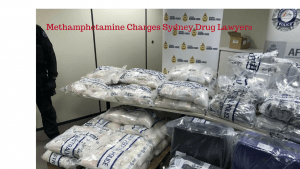 In New South Wales, the offences of possessing, manufacturing and supplying methamphetamine in commercial quantities are treated extremely seriously. If you have been charged with the possession, supply or manufacture of Methamphetamine, then contact George Sten & Co Criminal Lawyers now. These offences carry heavy penalties including terms of imprisonment and fines so it is imperative that you have an expert criminal defence lawyer on your side. To give yourself the best chance of avoiding jail time, speak to one of the drug offence lawyers at George Sten & Co immediately on (02) 9261 8640 or email us at georgesten@criminal-lawyer.com. If you require urgent legal advice outside of ordinary business hours, call our dedicated 24/7 phone on 0412 423 569. The legislation relating to the possession, supply and manufacture of prohibited drugs in New South Wales is found in the Drugs (Misuse and Trafficking) Act 1985 (NSW). A full list of ‘prohibited drugs’ can be found in Schedule 1 of the Act. a person who has possession of the drugs administering, or assisting in the self-administration of, the prohibited drug to the other person in accordance with the prescription or supply. The maximum penalty for the manufacture of methamphetamine in New South Wales is 2 years imprisonment and/or a $2,200 fines. Under the Act, there are two offences relating to the supply of prohibited drugs like methamphetamine. The first is supply of the prohibited drug and the second is supply of the prohibited drug on an ongoing basis. The supply of a commercial quantity of prohibited drugs by a person over the age of 18 to a person under the age of 16. In terms of the offences relating to supply to those under the age of 16, there is a potential defence outlined in the legislation. It is considered a defence if the defendant is able to satisfy the court that at the time the offence was committed, the defendant had reasonable cause to believe that the person who was procured was at least 16 years of age. In terms of the commercial quantity offences, if the jury is not satisfied that a commercial quantity of the prohibited drug was supplied, then the can try them for a lesser offence under Section 25. Section 25A of the Act outlines the offence of supplying prohibited drugs on an ongoing basis. A person who, on 3 or more occasions during a consecutive 30 day period supplies prohibited drugs including Methamphetamine for financial or material award is guilty of an offence. This offence carries extremely heavy penalties including fines up to $385,000 and/or a maximum of 20 years imprisonment. Methamphetamine – What is a commercial quantity? A commercial quantity of methamphetamine refers to 0.25kg or 250g of the prohibited drug. The manufacture or production of a commercial quantity of prohibited drugs that exposes a child to the production process or storage of substances for the process. Similar to the supply offences, the jury can try a person for a lesser offence if they are not satisfied that the person has manufactured a commercial quantity of the prohibited drug. Further, if it can be established that the manufacture and production of the prohibited rug or storage of substances for the manufacture of prohibited drugs, did not endanger the health or safety of the child, then you may have a defence to your charge. For the purposes of these offences, a child is a person under the age of 16 years. The maximum penalty for the manufacture of methamphetamine in New South Wales is 15 years imprisonment and/or up to $220,000 fines. It is an offence to possess instructions for the manufacture or production of prohibited drugs. There are defences to this offence if you are authorised to possess these through another authority. It is also an offence to possess certain apparatus for the manufacture or production of prohibited drugs like methamphetamine. At George Sten & Co Criminal Lawyers, we are specialists in the area of criminal law. We have vast experience dealing with ICE, Methamphetamine possession, manufacture and supply offences. Our team will assist you in building a quality legal defence and will represent you fiercely in court. If you have been charged with the possession, manufacture or supply of Methamphetamine, call George Sten & Co now on (02) 9261 8640 or email us at georgesten@criminal-lawyer.com. If you require urgent legal advice outside of ordinary business hours, call our dedicated 24/7 phone on 0412 423 569.